Why is a chef from one of the world’s top restaurants cooking in public school kitchens? 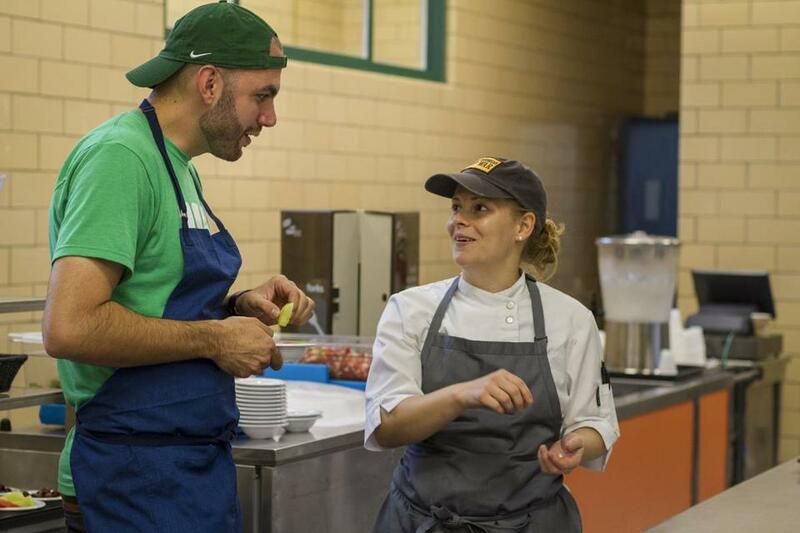 Daniel Giusti (with chef April Kindt) runs the school lunch programs in New London, Conn., where has made changes to the quality of food as well as the presentation of it. “What if we got a fryer and did something with dough? Like a pretzel?” Tyler Guerin asks. “No, we can’t use a fryer,” Ryan Kennedy says. Kennedy knows government regulations inside out. Fried foods are a no-go in public schools. He suggests some kind of popcorn. It’s in between lunch waves on a Thursday. In a few minutes, roughly 300 kids will flood into the cafeteria. The staff will rush to serve them as quickly as possible. Today’s entrée is pizza — barbecue chicken, cheese, or tomato basil with a layer of garlic on the crust. During the first wave they managed to set a record: serving everyone in under seven minutes. Efficiency matters in a 22-minute lunch period. There are two more waves to come, but in between, they’re thinking about whether seaweed could be a good seasoning to try. Really, they’re thinking about the essential challenge they face every day — how can they make the best possible food at the lowest possible price (roughly $1.25 per meal) while adhering to strict government-mandated nutritional guidelines? And how can they do that day in, day out, for hundreds of kids? At this time last year, Giusti was chef de cuisine at Noma, a Copenhagen restaurant with two Michelin stars that’s been repeatedly ranked as the world’s best. This September his new company, Brigaid, took over food services in two of New London’s public schools. He plans to run food services in all six by the start of next year. 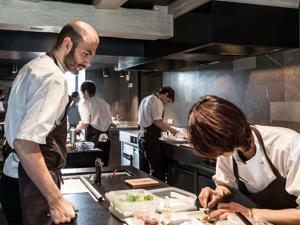 Daniel Giusti was chef de cuisine at Noma in Copenhagen, where the food earns two Michelin stars. School lunch came to mind, though he thought about it differently than many people. “I’ll tell you very frankly that nutrition was never part of my goal,” Giusti says. “Every conference you go to, that’s all they talk about: nutrition, nutrition, nutrition. The fact of the matter is, no one eats the food. So the food can’t be nutritious if no one eats the food.” The goal, from the beginning, was to make the food taste so good that kids actually wanted to eat it, and to inject thoughtfulness into the cafeteria experience. This sounds pretty good to most people, but in practical terms it involves a complete overhaul of the typical public school lunch service. The National School Lunch Program, started in 1946, has become the nation’s second-largest food assistance program. In 2014, it provided lunch to more than 30.3 million children during the school year. More than 70 percent of children were eligible for free or reduced-price lunch. The program dictates strict nutritional standards for lunches, updated when President Obama signed the Healthy, Hunger-Free Kids Act in 2010. Still, schools face massive challenges related to cost; often, about two-thirds of funds from the NSLP go toward labor, equipment, and overhead, sometimes leaving less than $1 for each meal. So many schools rely on frozen, canned, and processed foods. These must be up to nutritional standards, but they rarely taste good — and a good portion of food ends up in the trash. There have been efforts over the years to change this, and some have involved top chefs. Celebrity chef Jamie Oliver hosted multiple reality series about school lunches and his attempts to reform them. Alice Waters, of the famed Chez Panisse, founded the Edible Schoolyard at a middle school in Berkeley, Calif., which incorporated a garden and teaching kitchen into traditional classroom learning; sister programs have popped up around the country. More recently, Michelle Obama has also encouraged the “Chefs Move to Schools” initiative. Still, many of these chefs-in-schools efforts have involved more of a consulting role for chefs rather than full-time positions. And full-time chefs are critical to major reform, says Ann Cooper, a longtime activist and director of food services at Boulder Valley School District in Colorado. “Inevitably, if we want to have significantly better food in schools, we have to cook from scratch,” Cooper says. This was always part of Giusti’s goal. He traveled around the country and visited various districts last spring. Originally he wanted to be in Washington, D.C., where he’d lived and worked for about a decade prior to his time at Noma. “But no one was serious,” he says. Then he was introduced by e-mail to Manuel Rivera, superintendent of New London Public Schools. Rivera has worked in public education for years, so he knows something about school lunch. He believed they were doing better in New London than in most districts, but parents complained. Rivera says, “We had one parent at one meeting who came and dropped a bag of sugar down and said, ‘That’s how much was in my daughter’s sandwich this morning.’” Still, it was hard to know where to begin changing things. Then he and Giusti started e-mailing, and eventually talking on the phone. “It became clear to me that this was a guy who knew his stuff and it wasn’t just a whim,” Rivera says. He invited Giusti to come to New London for a week. New London, once the second-largest whaling town in the world, has struggled economically in the post-kerosene era. “Pretty much people characterize it as working class,” Rivera says. Most students in the district come from low-income families; last year, 91 percent qualified for free and reduced-price lunch. That number is so high that federal grants cover lunch for every student in New London Public Schools. When Giusti visited last February, he was drawn to New London. He liked that they didn’t contract out to a large company, and that they already had big kitchens in the schools. It’s a relatively small district — roughly 3,565 kids — which made the overhaul easier. And he saw a partner in Rivera. From there, things moved surprisingly quickly. The board approved Giusti’s plan in March and he started looking for chefs. He and Rivera secured supplemental funding from Target to cover the increased labor costs of having chefs in schools. He received more than 300 applications for six spots but ruled most of them out quickly. In the first two weeks, there were a lot of changes in the cafeteria, but some of the biggest aren’t really related to food at all. The first: no more Styrofoam containers for food. The kids started eating off real plates. Giusti says the change was motivated by environmental concerns, but also the dining experience. “It’s part of being thoughtful about every aspect of the meal,” Giusti says. Little differences like this are everywhere. The sandwiches they serve are now packaged in checkered paper and a layer of parchment paper, like a deli sandwich, instead of Saran wrap. Another change is that they put out drinking water — a surprisingly uncommon practice, because cafeterias are required to offer milk. “Since milk costs 27 cents, and you have to offer milk, offering something else on top of it not only costs you more, but it’s more of an effort,” Giusti says. They put out a big container of ice water with limes or lemons in it, and kids have been filling up their cups. Then there’s the actual food. The first lunch bell rings in the middle school at 11. Kids rush into the cafeteria, tittering and excited about pizza lunch. Kindt is wheeling a cart with snacks for sale — whole-wheat chocolate chip cookies and watermelon ice pops — and kids are swarming with dollar bills. But overall, the tone is enthusiastic. “Last year, there were these trays that were pre-shaped with little slots, and this year we get real plates,” says Julia Grant, also a seventh-grader. It hasn’t all been smooth sailing. One big issue has been dealing with the additional labor created for staff by the switch to plates. “We didn’t see that coming,” Giusti says. They’re still working through workflow issues and questions about cleanup responsibilities. This didn’t bother Giusti. He simply asked, “If the kids don’t like this, why would we serve it?” So they nixed the squash soup. Giusti takes the kids’ criticism the same way he took criticism at Noma — seriously. In general, the experiences have been more similar than one would expect, he says. Of course, there are the obvious differences: a clientele that is willing to spend upward of $250 for a meal versus one that eats for free, and how much money is available for labor, equipment, resources. But a main similarity is limitations. “The reason why a lot of successful world-renowned restaurants like Noma are successful is that they’ve put a lot of limitations on themselves,” Giusti says. “At Noma they’ll only source from a very small area, which makes it harder and pushes people to be better and think harder and be more innovative. So I think the idea of cooking to adhere to very specific nutritional guidelines at a low price point is just a different form of that kind of limitation.” Those limitations make the work interesting and challenging, and force them to work harder to be good. One difference: expectations. “At Noma, everyone is challenging you to make the best meal you’ve ever had,” Giusti says. “Here, you put some decent food on the table and everyone is like, this is great.” Giusti works hard to set those expectations higher, for himself and his staff. Every day, he and the two chefs fill out a daily journal. “It’s very simple. I ask, what worked today?” For example: “‘We served 864 people, and it went smoothly.’ So, 864 people in a school population of 921, when there’s a 93 percent attendance rate, means that almost everyone ate,” Giusti says. “Then I ask, what didn’t work today?” Cleanup workflow, a miscommunication about a delivery of chicken. In those terms, Giusti’s challenge starts to look slightly less complex: what works and what doesn’t, day by day.